BPA-free coffee makers, mostly with no plastic parts. Plastic-free coffee makers that don't give your coffee a "plastic taste". If you are looking for a coffee maker with no plastic parts, you are not alone. More and more people are fed up with the plastic taste, particularly from new coffee makers. A search for plastic-free coffee makers takes you away from the convenience of modern coffee makers and, for the most part, leads you to more traditional ways of making your favorite brew. Drip brewers and the new single serve coffee makers are made primarily of plastic parts. These plastic parts don’t generally carry recycling numbers, so it is hard to know exactly which plastics are being used. So, out of an abundance of caution, a lot of people are now seeking out coffee makers which are free of BPA and phthalates simply by choosing brewers with no plastic parts. Here is a rundown of the kinds of coffee makers you will find with no plastic parts, and one which is plastic, but BPA-free. Coffee percolators are generally made of steel and metal alloys, although some may include glass. 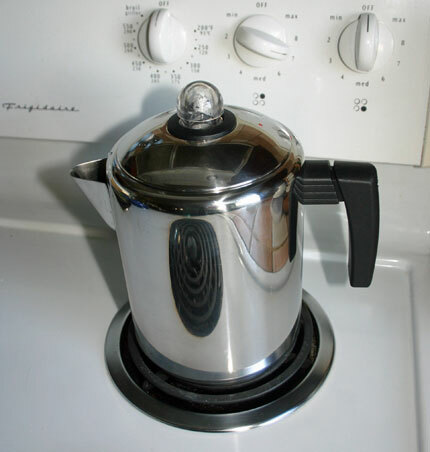 Percolators were very popular back in the days before Peets Coffee and Starbucks made gourmet quality coffee so popular. Coffee aficionados will tell you percolating coffee spoils the taste. But for many people it is still a popular way to brew, and it is plastic-free (with the exception of a rubber-like seal). A favorite from Italy, Moka pots are stovetop coffee makers which deliver a rich coffee that is somewhere between a regular coffee and an espresso. Many of these are made of aluminum, although there are models made from steel. As with percolators, the only plastic is in the form of a seal or gasket between the two parts of the brewer. 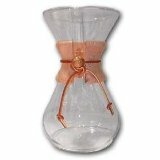 Remarkably, in this day and age, the Chemex coffee maker is made from glass, a wood collar and a leather strap. This is a manual drip brewer, so you place a paper filter in top half of the brewer. Really, it’s just a fancy filter cone. But instead of the coffee being dripped directly into your mug, it drips down into the bottom half of the glass jar. And it is undoubtedly 100% BPA-free, with no plastic parts at all. Yes, this is the least expensive of all ways to make coffee. And yes, most filter cones are made from plastic. However, you can get a porcelain filter cone. 100% free of plastic. As for the quality of the coffee, don’t worry. While automatic coffee makers may make brewing coffee for convenient, they don’t improve on the quality of the brew. Coffee made with a filter cone is just as good as coffee made with a top-end automatic brewer. Hourglass Cold Brew Coffee Maker. Yes, it is plastic, but it is BPA-free. In addition, the Hourglass uses a cold-brew method, which cuts back considerably on the acid-content of the final brew. This is a good choice for anyone who not only wants to make their coffee BPA-free, but also likes the idea of cutting back on their energy use. No heat of electricity required. Share your tips and opinions on BPA-free coffee makers. Share your experiences and opinions on coffee makers which are BPA-free, or have no plastic parts.